I love planning Safaris. But when I get to plan Family Safaris - woohoo! I am thinking of all the possibilities that can happen when a child or children are on Safari. They may come back home having seen something that will shape their future because of the people they will have met on Safari. 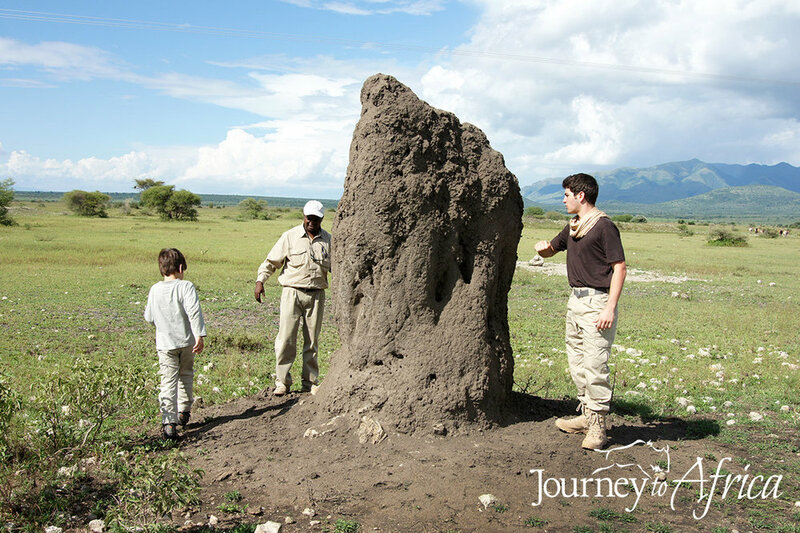 The wildlife stories told by their Safari guide will make them future conservationists. The forever memories that will be told for years during get-togethers. Endless! Here are some ideas to make your Family Safari go as smooth as possible. Most of the lodges have a family room and if we book ahead of time, we can get that room for you. You will have two rooms with usually a living room between the rooms. Most will also have two bathrooms within that space. Perfect when you have younger kids and are not comfortable with them having their own room yet or having to split up the adults. Safaris can be a bit of go-go-go especially if you are keen on waking up early to capture the sunrise but also want to be out until the last light of the day and enjoy the sunset. Slow Travel. Stay in one place for a few days to make it easy on yourself and settle down. You know you have a room ready for an afternoon siesta, the crew knows what foods the kids like, what drinks mama and baba need to wind down, etc. If there is a pool, take advantage of that as the pools will have amazing views. Having your own vehicle is appreciated by most families. The biggest advantage of this is that you can set your times. Want to sleep in a bit today - sure! Want to come back to camp early in the evening - of course! Fussy kid on the game drive - no worries! You and your Safari guide set the schedule versus having to go by a set schedule or have other guests give you that look. Plan B - cards, movies, book. Always have a Plan B. It is your holiday after all and some days, just take a break. All the camps we recommend have great views, amazing ambiance so even if you want to stay back and read, watch a movie in the afternoon, you are still part of the environment and you may have to pause to see wildlife stroll by the camp. Sawa! Okay, now let's get you on Safari. Feel Good Moment on Safari. I'd would like to share with you a warm fuzzy stop on your wildlife Safari experience in Northern Tanzania, a place that is near and dear to me. I know it will be yours as well. When you and your young world explorers want to head out on a life changing Family Safari in Africa to see the amazing wildlife but also want to leave a mark of compassion not only for wildlife but also citizens of the world; then let me introduce you to a children's home we support. Natalie came prepared with undergarments for the girls and boys. They were so thankful. When Baba Peter worked in the Safari industry with Mama India, he once told her he would like to help the many orphaned, neglected, abused children of Karatu region by providing them a safe home but would love her help in finding funding. Mama India had just moved from New York after a Mt. Kilimanjaro climb [which she did not want to do but on arrival, ended up falling in love with Tanzania], and told him sure. Well, years later, she and Peter have adopted around 100 kids from around Karatu region. Now why is this place different? Each child has a home. A home where there is a Mama. A mama to cuddle at night for when you have nightmares, a mama to cook your special food because it's your birthday, a mama to make sure you do your work, a mama who keeps you in check. Each home has around 10-15 kids so you actually feel like you are living in a home. There is a kitchen, a living space, a patio, some space in your room; just like home. Our client enjoying a game of soccer with the kids. Fun times for everyone. It's not only a safe space. It's where the child will thrive. The kids go to good school close by thanks to funding provided by you, me and the donors, have medical help onsite via a registered nurse, maybe their parents are being helped so they can get on their feet with micro-financing, have a lovely soccer field because well, soccer or football as we say, is huge, basketball court because there are lots of US volunteers and it's just a fun game and much more. Mama India and Baba Peter together with a team of volunteers truly care for the kids. We can set up an afternoon for you to spend time here. Play with the kids, see the mamas in action, learn more about the organization ++. And, I have many clients including Sydney, my young explorer who said she'll come back here and volunteer when 21. Now, that is a Safari moment for the books. A Typical Day on Safari in Tanzania. Everyday is a different day on Safari. No agendas; just you and your Safari guide making plans on what to see, where to go, how long to be out, and more. Here are guidelines to navigate your day on a Tanzanian Safari. For the most part, I'd say on Safari, waking up early should be the norm even if you are not a morning person. Why? Sunrise. This time of the day is truly glowing. Your wake-up call can be any where from 6:00 am onwards. 1. You can decide to have breakfast at the lodge. Enjoy coffee in your room, then head to the main area. Majority of the Safari lodges in the national parks have a deck looking out at the park. Enjoy the sunrise while eating breakfast. 2. Start around 6:30 am and go out looking for wildlife in the early morning, when the sun is lighting up the African soil. Have breakfast around 8:30 -9:00 am [or when your stomach calls for food] in the middle of the national park. This should be your choice at least once or twice in each national park. Depending when you have started, you will have two choices. 1. Stay out for lunch in the parks. If you have stayed in for breakfast, go out and stay out for a bit longer. There are many picnic spot your guide will take you or in some cases, you will eat in the car while watching the rhino crawl or in the middle of the Wildebeest Migration. You can come back to the Safari lodge at your own leisure for your afternoon siesta. 2. Come back for lunch at the Safari lodge. If you have been out from early morning, this can be an option. And if you want, squeeze in an outdoor shower when the sun is out. Around 3:30 - 4:00 pm, you will be heading out again if you have been in the Safari Lodge. Go out to capture the evening golden hour. If you've had enough for the day, stay back. There are no rules. You will be out and about until 6:30 pm, stretching it to 7:00 pm before you have to return back. Many a rush drive back have been had as you want to soak in every last light on Safari. Also, this is the time for sundowners. The time you park your vehicle, enjoy a drink while watching the glorious sunset in Africa. You will pinch yourself, you are on Safari. Pure cozy. Campfire, Safari stories by the camp manager or staff + dinner. Some stories that have to be heard like this Maasai warrior telling us about his right of passage by hunting lions. Keep an open mind - it's not all black and white, lots of grey, lots of changes that need to be made, lots of traditional ways that have to alter, lots of cultural stories that need a new course - listen. In the end, you decide your travel style. Some clients want to be out all day; they want to soak every minute of being on Safari. Others want to relax a bit more; have all meals or more meals at the lodge and go out on game drive at leisure. Whatever your style, you will love your day on Safari. Congratulations on your engagement! The best thing you have done is finding your love. The second best thing you are doing is talking to us about your Honeymoon Safari. Being on Safari, with the one you love, will be the icing on your cake. Having planned many honeymoon Safaris over the years, we have a few tips on what made their honeymoon a success. Take one tip or take all. Start off with some rest. Let's take you straight to the beaches of Zanzibar Island or exclusive Mnemba Island. You can catch some zzz's for a few days, enjoy massages by the Indian Ocean water and take leisure strolls on the beach. Recover from your wedding in paradise. Go to one of the National Parks or Rubondo Island with the intent of chilling. Safaris are usually a go-go affair. You usually wake up early to see the sunrise out in the park and can finish the day out. Instead, we will choose a lovely lodge or tented camp with great views from your room. You will still be part of the wilderness experience ... from your room. Stay longer in one spot. One of the things I learnt from my own honeymoon is the art of staying in one place for a bit longer. There is nothing worse then having to pack and unpack and move especially the first few nights when you are exhausted. That one extra thing besides wildlife. Take your honeymoon to the next level. We know just how to do that. Have a blessing ceremony. We can organize a Maasai ceremony at our camp in Ngorongoro Region with a Maasai elder. Stop at a local religious center in the town of Arusha. We can organize a blessing with the local worship leader. Hire a honeymoon photographer to capture your Honeymoon Safari memories. We can have the photographer shadow you for a day or two, or if you want, the whole Safari. You decide. Donate. Instead of getting gifts from your guests at your wedding, ask to give maybe a portion to a charity in Tanzania. Then go see how your donation will be put to good use. We are sponsors to many wonderful charities in Tanzania. We know your money will be put to great use. Ask us and we can match the organization with your interest. Together, let's create a perfect honeymoon Safari for you and your loved one. When on Safari, you spend a lot of time out searching for game during the day time. The best times are usually early in the morning when the temperatures are still cool and the animals are active… searching for breakfast. As the weather warms up from late morning to early afternoon time the animals, and maybe you too can enjoy some good siesta time. If siesta is not for you, go out and you will still find animals grazing or ‘lazing around’ – still enjoyable to witness. Of course there are some animals who can not rest – never a dull moment. They will get active again late afternoon when the weather cools down. With most national parks in Tanzania and Kenya, the parks close around 6:30 pm. It is for everyone’s safety. Private conservation areas like Ngaroi, east of Serengeti National Park do not have those restrictions. Some lodges located within a national park have special permission to offer night game drives. Oliver's Camp, one of my favorite camps in Tarangire National Park, was one of the pioneers in starting night game drives. My first night game ride was in dark, stormy night of November 2011. Covered in our rain coats, armed with a ranger and a brave wind-bearing spotter in our vehicle driven by Alex the camp manager at that time, we drove out looking for animals. We had night vision goggles to aid in our viewing. We saw three male lion brothers who were later heard roaring around the camp, vultures feasting on an elephant carcass, jackals and more. If it was not pouring, we would have had a two-hour ride heading towards the Silale swamp. Ours was cut short because of the rains. Oh, what a thrill! I have had many more night game drives since then. It is not so much about the wildlife that is easier to see during the day, but the anticipation of spotting the wildlife and the sounds that accompany it in the night. And the rewards can be pretty spookily beautiful. Take a spin with us at night. There will be a few surprising things to stare at on your night game Safari. Going on a Family Safari is a great investment. We are talking high yield in your family memory bank. You will also be alright with the 'Safari bug' you are bound to catch. Everyone who goes on Safari is struck. At this time, they don't have a fix and no one is looking for one. We are all busy. School, work, homework, deadlines, practice, etc. Go, go, go. The list is endless. When you are on Safari, you are forced to take a break from the day to day. That time spent in the Safari vehicle out game driving, with your camera capturing all that you can see, is time well spent together. Chatting, planning, life talks... it all happens when you have the gift of time. Uninterrupted time. Pauses are always welcomed for a cheetah spotting or an elephant herd. You will spend time in the Safari lodges and tented camps; to just chill in the lounge or your room, connecting as a family. You will love our Bush TV time. Take a book, listen to music or write in your journal. Time, moments, together to last a life-time. Learning never really stops. Whether you are on your winter, spring or summer break - or taking a break from school and learning about the world - the best education is to experience first hand. Learning happens throughout your Safari. On Safari, you will spend a lot of time with your Safari guide who will share a wealth of information on wildlife. Ask them about conservation efforts. Go to the root of the issue, you will see the other side of the coin. Talk to them about the people. In Tanzania for example, there are 152 tribes - what is their language, tradition, food, clothing and more. If you are going to a Hadza or Maasai village, you may get to partake in oral tradition, the way it was done hundreds of years ago. The Safari Lodges will have their own teaching. The crew will share regional dances. Ask them to introduce you to traditional and modern, internationally recognized songs, and of course food. They will incorporate lots of local dishes for you to try out. Be adventurous. Investment for the future of our Planet. "Travel is more than the seeing of sights; it is a change that goes on, deep and permanent, in the ideas of living." - Miriam Beard. I have been lucky to plan many family Safaris over the last 16 years for children ranging from 3 years old to 18 years. All come back with the same theme. Thankful. The children are thankful they got to experience something completely different than what they are used to at home. As a parent, you have just opened their eyes to how other people live in our planet and how we are all connected. Differences to be embraced. Similarities to be celebrated. We need more of that in the world right now. Help them realize how precious and endangered the wildlife are and how they need our help to be safe. The more we know, the more we can do. And if they have spent time with wildlife, the more they will understand the importance of protecting them for generations to come. A few of my children clients who have grown up, continue to sponsor organizations like Rift Valley Children's Fund because they made a stop there when visiting Ngorongoro Crater. Some became supporters of organizations like David Sheldrick Wildlife Trust after stopping by for a visit. Make your Family investment and head out on a Safari. We can help you plan one that will be the highlight of your travel memory bank. Best time to go on a Safari? One question we get a lot is what is the best time to go on Safari in Tanzania? Really, anytime you can make it, is good time for Safari. The wildlife is always present. Having said that, some people are extremely sensitive to heat and dust. If that is the case, stay away from December to March as Serengeti can be dry, dusty and hot [90Fs during the day with cooler 70Fs during the evening]. Our camps + vehicles do not have air condition which can be an issue for those with respiratory problems. Weather Guideline for your Safari Planning. November to December // Short rain season + Hot. Sporadic showers will not hinder your Safari. Wildebeest and zebra migration, one of the greatest wildlife spectacles on Earth, are heading to Southern to Eastern Serengeti and Ngorongoro Conservation Area. Southern Serengeti is the place to be as the lawn-mowers - our wildebeest and zebra - will be coming here. The southern parks like Selous, Ruaha and Katavi will start sprouting up grass. They don't have lawn-mowers. January to Mid-March // Can be dry + Hot. Birthing season for the Wildebeest and Zebra. Still in Southern to Eastern Serengeti and Ngorongoro Conservation Area. Tarangire National Park with its resident wildlife and its rivers and swamps will make you fall in love with this park anytime. The southern parks are still wonderful to explore. Mid-March/April to May // Long rain season + Warm to cool. Showers can last a few hours but when it clears, fresh skies. If you don’t mind being adventurous [plans may change but we always have a Plan B] this is a great time to visit and get some amazing deals on lodges. Paul Oliver, a specialist guide calls this the secret season – less crowd but awesome wildlife. Tarangire National Park, with tall grass and abundant water everywhere allowing wildlife to spread out, has black cotton soil which is tricky to drive on when it has rained hard but as we mentioned, get ready for an adventure. Ruaha will also have tall grasses and wildlife will have spread out but that surprise eye peaking out will make you scream - but don't - they walk away. Some lodges also take this time to close and work on their tents and give the crew training. Never fear, there is always a Safari Lodge open. June to July // Dry + Cooler months. June is green after the rains. Enjoy the sea of wild flowers. Migratory animals are roaming from Central to Western Serengeti on their way to Northern Serengeti. Wildlife from the surrounding areas are about to enter Tarangire National Park. August to October // Dry season + Cool to warm during day and cool during night. The wildebeest and zebra population is dispersed in Masai Mara to Northern Serengeti. Mara River crossing is a site to witness. Tarangire National Park is alive with wildlife thanks to its permanent Silale Swamp and Tarangire River. But, the weather is never predictable. Hence the adventure on Safari. Now, twende, let's go. What is a Luxury Safari? Luxury is relative to each one of us. Are you going to be happy with a perfectly good 5 gallon bucket private shower or do you need endless water and a bubble-bath tub? Can you handle a wilderness tent if it means enjoying a walking Safari away from the main camp? Just you and the open space. Or both as isn't travel the place to test our limits as well as indulge. We want to know more about your expectations on Safari. We have choices we can offer you on your Luxury Safari. Whatever your travel style, 4 things you are guaranteed when enjoying a Luxury Safari with Journey To Africa. Our Safaris take care of you from arrival into any airport in Tanzania or Kenya to when we drop you off at the airport for your flight home. “Safaris are like grandmothers” – Susan Portnoy, a photographer mentioned. All the care with the warm and fuzzy. You don't have to worry about opening your wallet when on Safari. All is taken care before you leave for your Safari. From your Safari vehicle with your expert guide, national park and conservation fees, meals, drinks which will be available in your vehicle, local flights, transfers mentioned, etc. You have to take care shopping and tips to the guide and crew. What we insist you must do is sit back and relax! You are on Safari. 2] EXPERIENCES AND GREAT MEMORIES. Many studies show that happy people are those who have accumulated experiences and memories in their lives. We aim to enhance your happiness. How do we plan on doing that? Via our guides and their knowledge, warmth, patience and more. To our first timer on Safari to our fifth timer client, our guides are our backbone. They help make great memories and experiences on your Safari. They are also our ambassadors. They will make you fall in love with being on Safari. Attention to details as well as adding memories to your Safari. We make sure all the dots and crosses are checked for your Safari. The adding memories part, we don’t want to give away too much but it’s the little things that make the big memories happen. 3] RIGHT PLACE, RIGHT TIME, RIGHT FIT. We pay lots of attention to the lodge or tented camp we choose for you. This is a big part of your Safari budget and the selection has to work for you. Right Place and Right Time. Crucial. We want you to maximize your wildlife viewing hence the lodges or tented camp has to be in the right place for the time of your travel. We will not go to a lodge or tented camp just because it is beautiful if it is not the right time to be in that area especially in Serengeti where you follow the Wildebeest and Zebra Migration. However, if going there is extremely important for you, we can make that happen or if you have extended time on Safari, sure. We have a range of preferred lodges and tented camps, in different budgets, for us to recommend to you. Are you a family, multigenerational family, on honeymoon or anniversary, friend group, solo ... the lodge and tented camp will be suggested accordingly. The core values can not be compromised - food quality, room amenities, staff service, ambiance of the lodge, etc. Even if you are 'roughing it' with our wilderness camping, the core expectations have to be met for us to offer them to you. 4] LODGES WITH A SOUL. Our criteria when choosing the lodges we recommend is that they have to have the 3 Cs. Conservation + Community + Carbon off-setting ethos. Your dollars must help out in a lot of behind the scenes effort. The ability to assist the visiting country, it’s people and the precious wildlife. When picking the lodges or tented camps we recommend, this is a big priority. Whether it is wildlife conservation via Honeyguide Foundation with our ground partners or supporting a sustainable orphanage by building a fully equipped bakery like Rhotia Valley Tented Lodge or off setting carbon footprints like our walking Safari partners. Our lodges also support a lot of families. A staff member in our lodge will take care of 4-6 + family members at home. Your Safari dollars will go a long way on your Safari in Tanzania. Ask us for more details on each lodge and tented camp and which organization or charity each supports. We hope you will enjoy a Luxury Safari with Journey To Africa.